al-Baqi gate is the closest located gate to the Prophet Muhammad's burial chamber. It is one of the three gates (Bab al-Baqi', Bab Jibraeel, and Bab un-Nisa) on the eastern side that retain the architectural style of gates from first Saudi expansion. There are three inscriptions over the gate's facade, top most reads; . Second one is durood; and the third is the dua' (prayer) to enter (any) mosque. Previously the al-Baqi' gate did not exist it was installed during the Masjid's expansion by malik al-Fahad circa 1987 CE. The Bab al-Baqi' is located closest to the Rawda of prophet Muhammad, and directly inline with Bab as-Salam. Bab al-Baqi just after entering, to the right is the south-east corner of Prophet Muhammad's burial chamber. Bab al-Baqi', gate no. 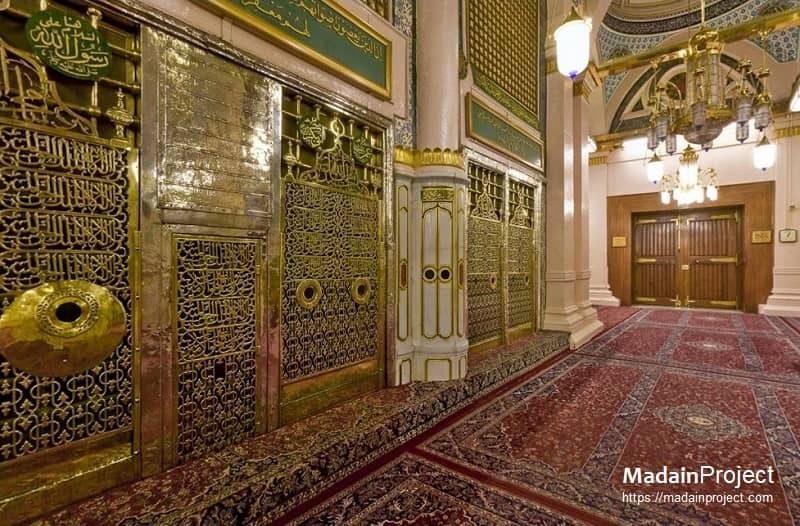 41, is one of the major gates of Masjid an-Nabawi. The minaret of al-Baqi' gate (ٱلْبَقِيع‎ مئذنة باب ), is the second tallest of the currently ten minarets of Masjid al-Nabawi. It is located on the south-eastern corner of old Ottoman era masjid. It is the closest minaret to the Green Dome (القبة الخضراء) over the tomb of prophet Muhammad. South-east corner of the Prophet's burial chamber (Aiesha bint abi-Bakr's House), as viewed from Bab al-Baqi, in the left isle are the Iconic Golden Grills. The western aisle (left) directly leads towards the Bab as-Salam and northern aisle (right) leads towards the Bab Jibraeel and Bab un-Nisa. Interior of Bab al-Baqi' (extreme right), with Golden Grills of the prophet Muhammad's tomb (left). Looking east towards the gate's interior from the southern aisle. The first large circular disk to the extreme left is the viewing hole towards the Maqsoora. Base of the Bab al-Baqi minaret with Bab al-Baqi's interior (extreme left) and the entrance to the medieval era minaret (small door to the left). 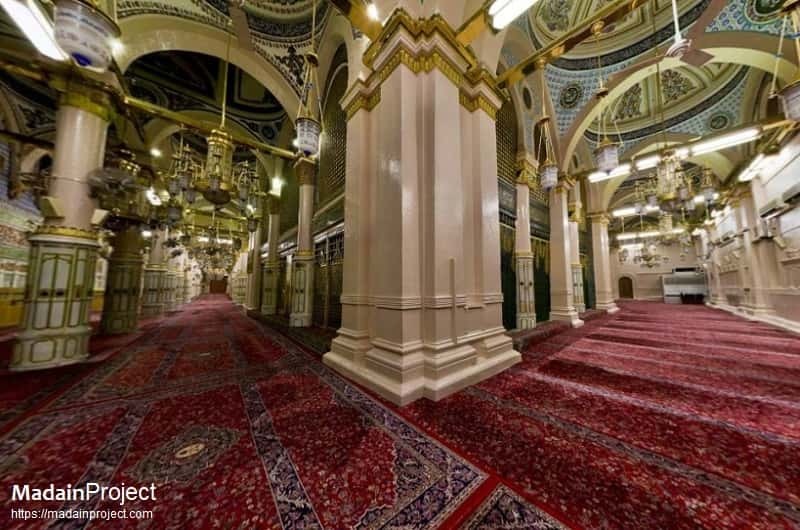 The pillar to the extreme right is the south-east corner of the prophet's tomb. The wall of the base of the Bab al-Baqi' minaret is adorned with calligraphic inscriptions of verse from Quran. Modern day aerial view of the Jannat ul-Baqi' cemetery, after which the Bab al-Baqi' is named. View looking east, as seen from the balcony of Bab Abdulaziz minaret.